Both big and small companies resort to outsourcing their business functions. Either they choose to outsource most of their functions or just a handful of them so that they can focus on core business aspects. In both cases, they need to take into consideration some key factors, which will ultimately help them take the informed decision. 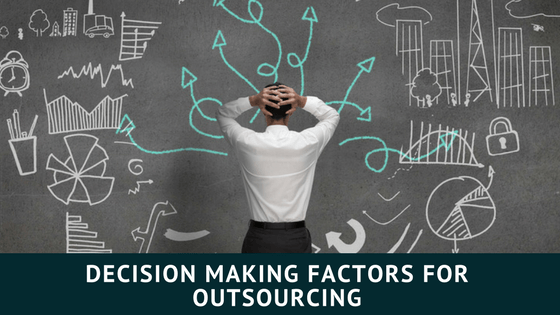 Let’s take a look at some of the factors to consider for taking outsourcing decisions for your business. When you talk in pure business terms, outsourcing needs to improve your business bottom lines through reduced operational costs. If you don’t see this happening anywhere in the near future, chances are that you’ll end up spending more than you end up saving. You don’t need to be an expert analyst to figure out where you’re heading. All you’ve to see is whether outsourcing will help you reduce a significant amount of your capital in hiring employee and equipment. At the same time, you will also need to maintain a balance between the quality and quantity of the services provided by the outsourced employees/firm. For instance, if you outsource accounting, you need to see if carrying out this function is taking up more resources and costs as compared to outsourcing it. We already discussed how cost-cuttings by hiring talent in a low price tag is one of the most common factors why companies outsource. You’ll get several vendors offering their resources at a competitive price. However, instead of going for the cheapest vendor, compare and find out what are you going to get from other vendors as well. For instance, some vendors will also offer customer support at no extra charge, which is a great deal in itself. Just remember that although price is an important factor, it should not be the ONLY factor that helps you zero-in on a vendor. Technology and resources are two considerations that are essential when you choose to outsource. Ask the vendor about the tools and technologies they are going to use for your project and how capable are they of handling all your outsourcing needs? What about the resources? Are they well trained for the assignments? Does the vendor have an office with up-to-date systems and can handle the most rigorous of the outsourcing functions? Answers to questions like these will lead the way to select the apt vendor who has the best resources and updated technology for seamless handling of your business functions. Timeliness in outsourcing is as important as the costs. For instance, if a vendor fails to toe the deadlines, it can lead to major bottlenecks. That alone will nullify any cost-saving benefits that you had anticipated while hiring them. You need to ensure that the vendor adheres to the promised quality and timeliness. One of the ways to do this is by making all your queries beforehand. If you find that the vendor has little quality control measures or does not have any backup plan should they miss a deadline, it is better not to hire them in the first place. When you hire an outsourcing vendor to work on your business requirements, it’s a given that they are going to take care of everything from the scratch. There should be no room for sloppy or shoddy work and they should be able to produce the results. Choosing a responsible vendor who will be in charge of the projects is a must-have so that you only need to supervise them minimally and let them take it from there. This will give you more time to focus on your core business functionalities. More often than not, there are certain functional areas that can build up liabilities for a business. This eats up time and money, which can be spent elsewhere. You can cleverly outsource certain functions to reduce the liabilities an extent. Before you sign on the dotted line, do make it a point to visit the vendor’s site. Apart from this, also research on the internet to find more about the firm, the infrastructure, safety practices and the team that works there. This will help you assess the reliability of the service providers. If you have a reference who’ve worked with a vendor in the past, you can also ask them about the firm. This takes us to the next point. You can’t just have blind faith in the outsourcing team even if you’re saving significantly by hiring them. Find out all that you can, including the team members who’ll be working on the projects and who’ll lead that team. Learning these facts upfront will save you from several agonies at a later stage. Moreover, when you know that your business functions are in able hands, you’ll be at peace. The SLA (Service Level Agreement) is one of the most crucial documents when we talk about outsourcing partnerships. At the time of creating the document, make it a point to ensure that every single detail is written clearly. This will help you avoid you any kind of confusion or ambiguity especially about the quality of the services you’ll be getting. It also makes sense to hire a lawyer especially to manage your outsourcing endeavor so that you don’t end up in any legal trouble. Communication is the key whether you’re working onshore or with an offshore team. The vendors should be able to handle your queries and promptly reply without making you wait indefinitely. Their communication skills need to be spot on without any space for cultural or other communication barriers. This ensures that they have clearly understood your requirements and can address any issue that may crop up. ​​10 Outsourcing Tips to Grow Your business Successfully. ​During a downturn in the economy when the demands for products and services touch the lowest level and cost is sky rocketing, outsourcing acts like a savior. Majority of the companies look for cost-effective solutions to run the business operations with effectiveness and maximizing the performance of an organization during the period of recession. ​The cost of labor can take a toll on the profits of a business. In the tough times your definitive choice is outsourcing to increase your productivity at the same time you will end up saving substantial cost. When you look for an outsourcing partner, you get a grasp on the procedures and approaches that can make your business run in a seamless manner. For instance, establishing positive relationship with the customers requires strategic skills that can become effective with the assistance of a genuine outsourcing services provider. ​When you outsource services to a company which is located offshore, the target is to access better workforce that can handle your tasks with a different approach and is identified as a turning point in business. There are some businesses that try to do everything on their own without realizing that it is a counter-productive step. ​When you are trying to step into a phase of growth in business, it is necessary to envisage the big picture rather than getting into the realm of trivial tasks and taking proper steps can make all the difference. 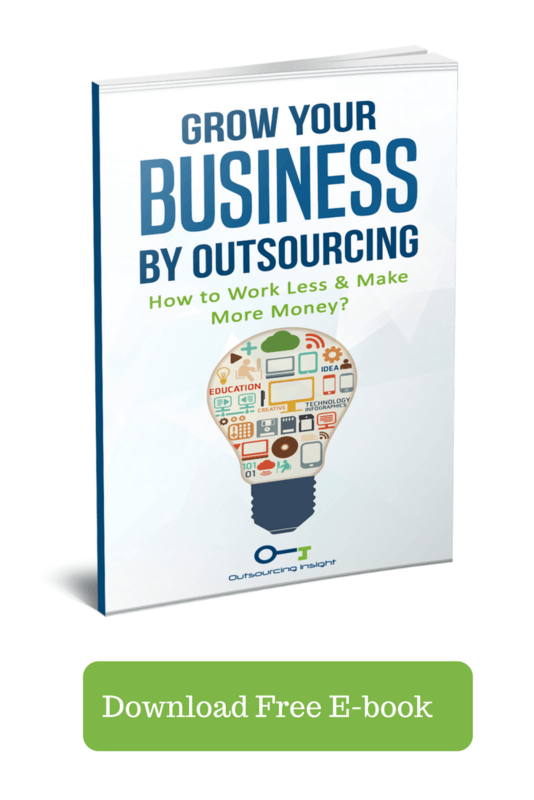 ​Have a glimpse of these outsourcing tips that can get you started in your business. t is more like filling the gaps in business with the best tactics and focusing areas that require attention of experts. For instance, you might want to bring a radical change in the infrastructure or anticipate a major change in the output or manage the operational costs to reduce the outflow of cash. Thus, you have to create a plan for the services that you require before having a virtual assistant right away. ​Understanding the basic objective of outsourcing : It is not enough to outsource simply because it can help you save costs. It is true that outsourcing is cost-effective but you have to know the exact reason for which you require the services of an outsourcing company. An organization might want to consider the option of outsourcing to gain a competitive edge while another business might want to reduce the overhead cost or generate more revenue. In short, a business must focus on the reason and benefits of outsourcing which can have a positive impact on the business. ​Identifying the reasons for which outsourcing is effective : You have to identify and find the causes for which outsourcing can be an effective option for the services that you need to obtain from a company that has better skills to handle those tasks. While a lot has been heard and said about outsourcing and its benefits, it is much like a matchmaking company for organizations that want to obtain services that resonate with the requirements of the business. Make sure that the company you have hired has understood your objective and the benefits of hiring come into effect in the real sense. ​Getting quotes from different service providers : If you want to get the best services, you have to talk to a few outsourcing companies to find out the service that they offer and whether they match with your requirements. Finding a good vendor can be a challenging task as there is a host of companies that offer these services and you need to find one that can handle the tasks that you want. There are multiple companies like www.axiombpm.com and freelance job sites like www.upwork.com , www.guru.com etc. You may also want to decide on whether to outsource to an agency vs freelancer. ​Knowing the points of contact : It is important to find out from known resources about the ways in which you have to search for reliable outsourcing companies. However, you can also prefer to carry out an independent research although following a set of guidelines can provide you with the opportunity to get the best when you are looking for outsourcing services. Getting referrals and recommendations from those people that have availed these services can also work in your favor. ​Creating deadlines and completion of work: When it comes to outsourcing, you have to create a set of deadlines for completion of projects. Although reliable service providers offer a time frame for delivering the services, there is no dearth of companies that fail to meet the expectations of their clients. It is good to steer clear of such companies and associate with those organizations that have the reputation of offering the best to the clients. ​Reviewing the outsourcing contract: As soon as you get a copy of the outsourcing contract, you have to read in between the lines and try to get a grasp of the points that are mentioned therein. However, if you want better conviction in work, the best option is get the review done by a legal expert. A professional legal counsel has the ability to locate the discrepancies in the terms of agreement and can offer you advice against it to avoid landing in a pile of mess later. Unless you read the document of agreement carefully, you might just miss out on some of the most important points that are essential before you get started with outsourcing services. Hiring a legal counsel is good to get clarifications about the points that have been mentioned in the contract and creates an avenue for you to ask questions even when there is a slightest speck of suspicion. ​Communication and review of work: Many of you might just think that hiring an outsourcing company can produce miraculous results although you have to review the flip side at first. When you avail the services of an outsourcing company, it is necessary to review the progress of work regularly. Communicating with the outsourcing company is essential to know where you stand or whether the benefits have started showing for which you have considered availing services from the company. ​Taking informed decisions: It is good not to base your decisions on the cost-effectiveness of the services. When you hire an outsourcing company, it is necessary to find out whether you can get a balance of quality work and affordable services. In short, you have to find out whether the services that you intend to hire will offer value to your business and provide you with an opportunity to outbid your competitors. For this, you have to stay away from those service providers that quote extremely low prices which either implies that the company has not understood the nature of the work that they need to deliver or do not have the know how to start processing the ideas. ​Transparent ideas and work process: While hiring an outsourcing company, do not hesitate to ask questions to the service providers that can be related to any aspect of outsourcing or specific queries about the project that you intend to assign to the company. In addition to this, you have to be clear about the hours of working when you hire a company that belongs to a different time zone. For some projects, the time zone of the outsourcing company can extend the working hours of your business leading to completion of projects ahead of time. ​Even if you have a manual for the working process, you can try to find out whether your virtual assistant can provide effective services in real time. The best thing is to begin with a small project when you are hiring the services of an outsourcing partner for the first time that will allow you to find out the style of work that the company follows and the ability of the workforce to complete the task within the desired time frame. ​The next thing that you have to keep in mind is that hiring the services of an outsourcing company which is conversant with the recent tools and technologies that are implemented in this field makes sense. After all, you will never want to stay behind your competitors in a bid to hire cost-effective services from your outsourcing partner. ​Reviewing the benefits of outsourcing will not help you much rather you have to make serious efforts to understand what outsourcing is all about and whether your business will benefit from the services or not. Furthermore, you can communicate with the outsourcing company and make time for meetings that can be conducted on Skype at least for the first few months. ​It is important for the outsourcing company to know that you are aware of the services and the level of quality that a reliable company offers to the clients and expect to get the best from them. For small businesses the risks of outsourcing has to be studied at first when the work is delegated to another company. Therefore, justifying the credibility of the service provider is necessary to get services in the hour of need. ​Setting a realistic budget is also important when you hire the services from a company which is located offshore as the time frame is likely to extend beyond the schedule. Terminating the contract at the beginning can save you time and money rather than finding out later that the service provider has not delivered the quality of work that would have benefited your business. These are some of the price and non-price factors that play an important role in helping you decide a vendor for your outsourcing projects. For more such insightful write-ups about outsourcing, keep a tab on this space. We’ll be back with more. Cheers!